James Coppinger is the Sky Bet League Two Player of the Month for August. Doncaster Rovers star James Coppinger has won the Sky Bet League Two Player of the Month award for August. Coppinger, 35, scored two goals and made another three to get his 13th season with Rovers off to an impressive start. Tomorrow at Morecambe he will make his 500th appearance for the club. Coppinger said: “I was buzzing to be nominated for Player of the Month, and to win is brilliant. To get this at the same time as I hopefully make my 500th appearance for this special club is a real honour. 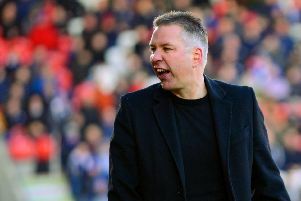 Rovers boss Darren Ferguson said: “He has been a real influence in games, which is what you want him to be. He knows he has had to get more goals and assists, and he has certainly done that. Sky Sports’ Football League pundit Don Goodman said: “Just one game short of 500 for a club that he joined over 12 years ago, Coppinger is a rare example of loyalty in a game where there’s rarely space for sentimentality. There is no doubt in my mind that he can operate at a higher level. The judging panel for the Sky Bet Player of the Month comprises Sky Sports’ EFL expert Don Goodman, EFL Communications Director Mark Rowan, League Managers’ Association Director Olaf Dixon and Sky Bet Football Trading Manager Paul Lowery.